There continues to be considerable interest in whether small refinery exemptions (SREs) under the RFS have “destroyed” demand for ethanol in the physical market. It seems obvious that this would be the case since SREs have had the effect of annually waiving more than a billion gallons of the conventional ethanol mandate under the RFS since 2017. However, the analysis in two earlier farmdoc daily articles (September 13, 2018; December 13, 2018) provides little evidence that the aggregate blend rate for ethanol has been reduced by SREs. 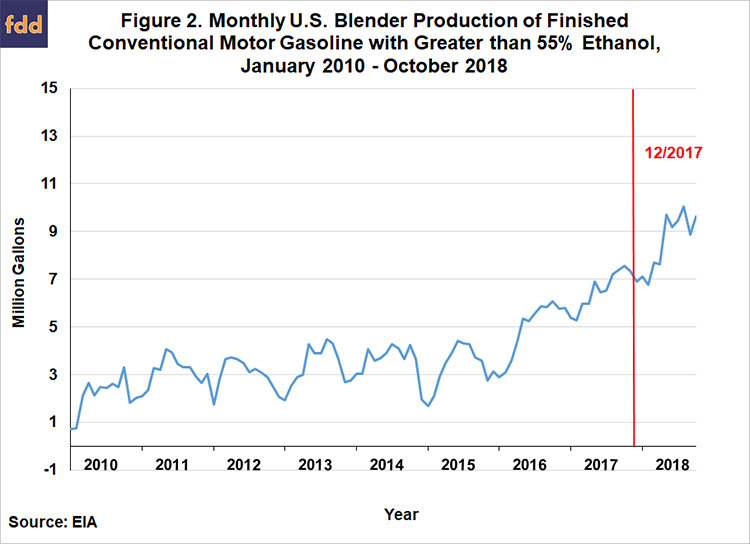 The reason for this counter-intuitive result is that the vast majority of ethanol in the U.S. is consumed in the form of E10 and ethanol has been price competitive in the E10 gasoline blend up until very recently. The price competitiveness of ethanol in E10 means that the conventional ethanol mandate is non-binding up to the E10 blend wall. The situation is very different for ethanol use above the E10 blend wall. It is generally assumed that higher ethanol blends, such as E15 and E85, must be subsidized in order to incentivize use. Under the RFS, the subsidy is provided by D6 ethanol RINs, with a high price of the RIN providing a high subsidy and a low price providing a low subsidy. Since SREs have had the effect of sharply reducing D6 RIN prices, demand for ethanol in the form of E15 and E85 should be reduced as a result. The purpose of this article is to investigate whether E85 demand has been reduced by SREs as expected. The focus is on E85 because there is virtually no data in the public domain on E15 use. We begin by reviewing D6 RIN prices because they are central to the expected impact of SREs on E85 demand. 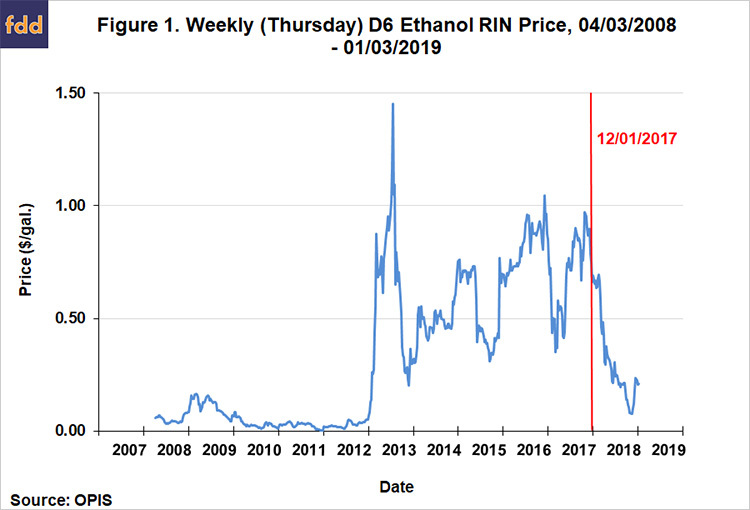 Figure 1 shows weekly D6 ethanol RIN prices from April 3, 2008 through January 3, 2019. D6 prices dropped precipitously after December 2017, from around $0.90 per gallon to as low as $0.08 per gallon. Prices most recently have rebounded near $0.20. While several factors have worked to drive D6 prices lower, including expectations for the biodiesel tax credit to be renewed, the dominant factor was undoubtedly the SREs. The reason is that the SREs pushed the conventional ethanol mandate below the E10 blend wall, thereby breaking the link between more expensive D4 RINs and D6 RINs, and at the same time greatly increased the supply of D6 RINs available in the secondary market. The dramatic drop in the price of D6 RINs should have substantially reduced incentives for E85 use, if not eliminated them entirely. The basic principle underlying the RFS is that retail fuel blends with a low percentage of biofuels effectively subsidize fuel blends with a high percentage of biofuels. This assumes that pricing in both the fuel and RIN markets is perfectly competitive so that RIN values are fully passed through from producers to consumers at the pump. Since E85 has a large percentage of biofuels it should receive a large subsidy, which in turn should expand use and help meet the RFS conventional ethanol mandate. The key question is what level of D6 RIN prices is required to incentivize drivers to switch from E10 to E85, assuming they have a flexible fuel vehicle (FFV) that can use E85. While a full analysis is beyond the scope of this article, it is safe to say that the breakeven D6 price at current ethanol and gasoline prices is well above the current level of about $0.20. The analysis in the report by Lade, Pouliot, and Babcock (2018) suggests a D6 RIN price in the range of $0.60 to $1.20 is required, depending on assumptions about consumer behavior. The bottom-line is that the SRE-driven crash in D6 RIN prices has dramatically reduced the incentives needed to encourage E85 use. The next step in the analysis is to examine the available data on E85 use to see if it has declined as expected. Unfortunately, the available data on E85 use in the U.S. is incomplete, and therefore, the total amount of E85 use is unknown. In all likelihood, the most comprehensive effort to estimate total E85 use is in the annual EPA rulemakings for the RFS. The estimates in rulemakings for recent years suggest total E85 use is a tiny sliver of total gasoline use, at most 200-300 million gallons per year (out of more than 140 billion gallons of gasoline consumed annually in the U.S.). This implies total ethanol use of roughly 150-225 million gallons in E85, assuming an average ethanol content of 74 percent. Given that we are interested in E85 usage in recent months and this is not covered by EPA estimates, the best that can be done is to examine the data available in the public domain and see if consistent trends are observed. The first series we use is from the EIA on conventional gasoline that is blended with at least 55 percent ethanol. The minimum level of ethanol in a gasoline blend to be considered E85 in the U.S. is 51 percent, hence the 55 percent lower bound. Figure 2 shows monthly values for this measure of E85 use in the U.S. from January 2010 through October 2018. Surprisingly, the EIA data show a notable increase in E85 use after December 2017. In fact, according to this data series, E85 use was up 32 percent for December 2017 through October 2018 compared to the same period a year earlier. Of course, it should be kept in mind that much of E85 use occurs outside of the EIA survey used to estimate this series. The coverage of the EIA series is probably in the range of one-third to one-half of total E85 use, as benchmarked in annual RFS rulemakings from the EPA. The second and third series on E85 use are collected at the state level for Iowa and Minnesota by the Iowa Department of Revenue and the Minnesota Commerce Department, respectively. Figure 3 shows monthly E85 use for each state over January 2007 through November 2018. While there is a great deal of variation in usage for each state, once again, there is a notable uptick in E85 use after December 2017. 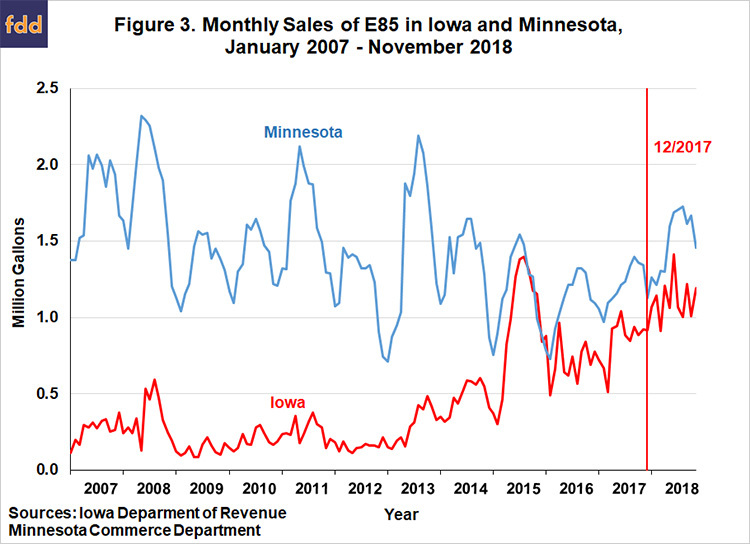 E85 use in Iowa was up 32 percent for December 2017 through October 2018 compared to the same period a year earlier, the same as indicated for the national EIA series, and Minnesota was up 25 percent. It should be kept in mind that total E85 use in the two states is only about 25 million gallons and the overlap between the state level data and national level EIA data is unknown. Nonetheless, the trends in E85 use across the three data series are quite consistent. A clear conclusion can be reached based on the available data. Specifically, the trend in E85 use since December 2017 is exactly the opposite of that projected based on the SRE-driven collapse in D6 ethanol RIN prices. If E85 use is not primarily being driven by RIN prices, what is driving it? Figure 4 provides a clue. 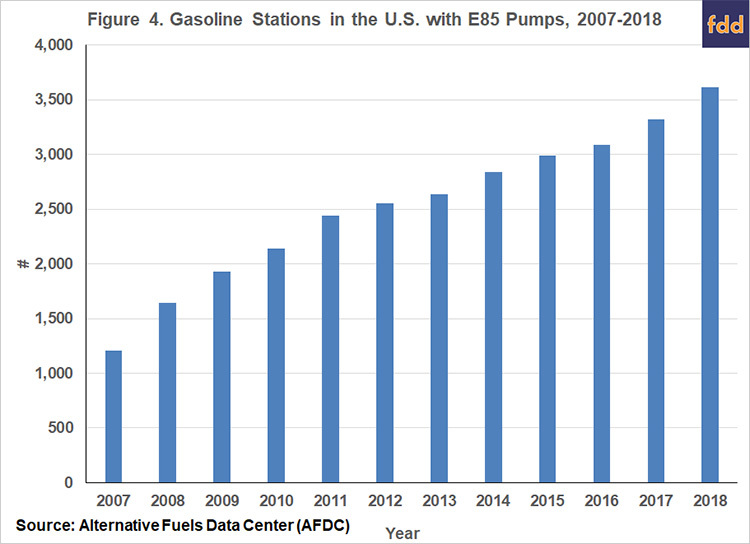 The figure plots the number of gas stations in the U.S. that offer E85 pumps over 2007 through 2018. There was a 7 percent increase in E85 pumps in 2017 and another 9 percent increase in 2018, after a five-year period of lower growth in stations offering E85 pumps. The increases in the last two years were probably due to the USDA Blender Infrastructure Program that was announced in late 2015. It appears that the positive impacts of the expansion in the number of blender pumps on E85 use overwhelmed any disincentives provided by low D6 ethanol RIN prices. The data now clearly show that small refinery exemptions (SREs) under the RFS have not reduced physical ethanol use in the form of E10 gasoline blends (farmdoc daily, September 13, 2018; December 13, 2018). However, the SREs have dramatically lowered D6 ethanol RIN prices and this should have reduced if not eliminated the incentive needed to encourage usage of higher ethanol blends such as E15 and E85. We examine the available data on E85 use in this article in order to see if trends in usage are consistent with this expectation. Surprisingly, each of the three series available in the public domain on E85 use show a consistent upward trend since December 2017, just the opposite of that predicted by the SRE-driven crash in D6 RIN prices. Furthermore, all three series show double-digit increases in E85 use during the December 2017 through October 2018 period. It appears that something other than RIN prices has been driving E85 use in recent months, and that something else appears to be growth in the number of gas stations offering E85 pumps. In all likelihood, this growth can be traced to the USDA Blender Infrastructure Program that was announced in late 2015. Finally, it is important to recognize that the public data on E85 use in the U.S. is incomplete and this should be considered when viewing the results presented in this article. Irwin, S. "More on Small Refinery Exemptions and Ethanol Demand Destruction." farmdoc daily (8):228, Department of Agricultural and Consumer Economics, University of Illinois at Urbana-Champaign, December 13, 2018. Irwin, S. "Small Refinery Exemptions and Ethanol Demand Destruction." farmdoc daily (8):170, Department of Agricultural and Consumer Economics, University of Illinois at Urbana-Champaign, September 13, 2018. What’s Behind Rising E85 Use?